The RAM-B-166-103U 1" Ball Medium Length Double Socket Arm features a 3.3" twist lock suction cap to attach to glass and non-porous plastic, and a 1" diameter ball socket. 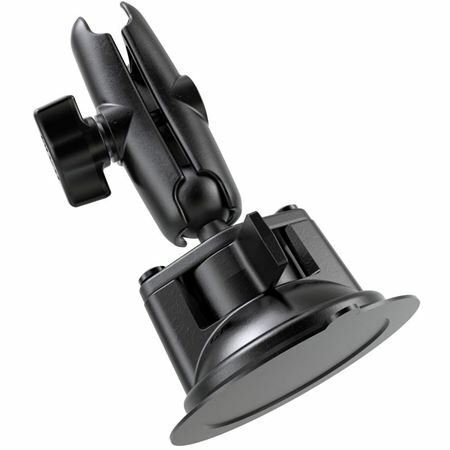 The RAM-B-166-103U RAM 1" Ball Medium Length Double Socket Arm with 3.3" Diameter Suction Cup Twist-Lock Base from the RAM Mount Bases range is made of a suction twist lock base (3.3”) and for a 1” diamond ball base with the standard size double socket arm. The suction cup is compatible with most surfaces, including glass and plastic. You are allowed maximum adjustment potential with adjustable points at each end of the double socket arm with this mount from the RAM Mount Bases line.